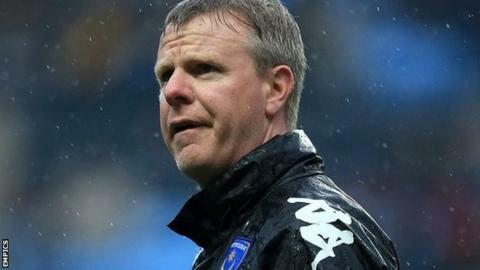 Ex-Portsmouth boss Andy Awford says the "rug was pulled" from him as he lost his job last month despite helping the side avoid relegation last year. Awford, 42, was understood originally to have left his role at the League Two club by mutual consent after just over a year in charge. "To start with there was anger, disappointment," he told BBC Radio Solent. "The job I did to keep them up last year was my greatest achievement." He added: "I was then trying to build something for a long time. That rug was pulled, we did not do well enough." However, Awford says he is proud of his record at the club. "When you look at the win percentage of 36%, and take Harry Redknapp out of it, I'm the most successful [Pompey] manager in the last 20 years," he said. Formerly the club's academy boss, he replaced Richie Barker as manager in March last year and won five out of six games, with the other drawn, to secure Pompey's League Two status. "I took over a side that was heading out of the league. We would have got relegated but we managed to turn that around," said ex-Pompey defender Awford. Awford was aware of a target to reach the play-offs this season, but although Pompey were 14th when he left, he believes he should have been given longer by the board. "I had a decent stint, but I would have liked the opportunity to start next season with my players and be judged on next season," he said. "I was aware of the target, but I did not know that was a job-breaker. There will be a lot of clubs in the league that will miss out on the play offs but are they going to sack their manager? I don't think so. "Had I been given the opportunity to lead the team next season and it came to September-October and we were 15th-16th then I would have gone to the board and said 'give someone else a go'." Awford added: "To be manager of the football club, is to manage the club not just coaching the first team. "That's probably a mistake I made because people at the football club probably had a more short-term view than I did and wanted instant success which very rarely happens in football. "There were lots of things at the football club that we were trying to improve (academy, recruitment) and I was central to that. In hindsight I should have concentrated on the first-team, but that is not me, because of where the football club has been through, we've got to rebuild it." Portsmouth were in the Premier League as recently as 2010, and having sunk to the bottom tier of the Football League, the club now have aspirations to begin the climb in the opposite direction. However, Awford says that at present, the right infrastructure is not in place to sustain those ambitions. "The training ground for instance, it's great that we've got it, but it's not fit for purpose," he said. "I'm frightened to death that the team is going to get somewhere, but the rest of the football club is not going to be able to sustain it. Maybe I worried about that too much." Awford said that management did change him as a person. "I probably did change and I wish I hadn't," he said. "The minute I became manager I wanted to run the football club. "I would have done a lot of things differently. The departure of [first-team coach] Alan McLoughlin and arrival of Gary Waddock [as assistant boss] could have been handled better without a shadow of doubt." Awford says he still has plenty to offer football and is open to the idea of returning to Fratton Park in a different role, an idea mooted by the club. "You always have self-doubt," he added. "Whether I need to step away and come back in a few months or years I do not know. "I've got a lot to consider. We spoke about a role for me at the football club briefly on the day we agreed I would no longer be manager. We still have to have those discussions, but that is in the club's court. "It's up to them. If they think there is a role for me at the football club I will listen to them."